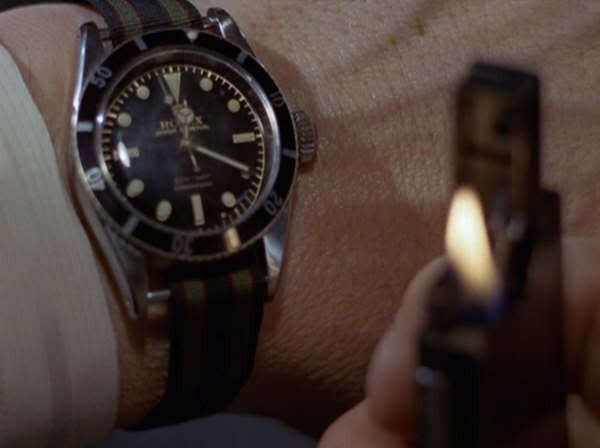 For years now watch collectors have been wearing what were termed “Bond” straps that were believed to have been patterned after the straps James Bond wore in movies. The only thing was, after a while it became more and more clear that what had become conventionally known as the “Bond” pattern wasn’t a very faithful replica of the original at all. Both the color scheme and the G-10/”NATO” construction pattern turned out to be completely wrong. Close inspection of stills from the movies seemed to indicate that what were thought to be gray stripes are probably closer to olive tone, and the presence of thin burgundy-colored stripes along the edges of the gray. As well, instead of the G10 pattern, the construction seemed to be a simple one-piece design with keeper made from the fabric. 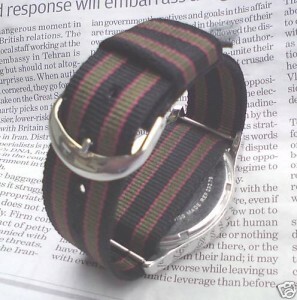 Note the "self" fabric keeper vs. metal hardware of a G10/"NATO" pattern. No one seems really quite sure how the previous incorrect “Bond” pattern came into being. According to one account it was originally made by Esquire magazine for a promotion coinciding roughly with the release of “GoldenEye” in 1995, and it proved so popular that there was an encore production run and then a bevy of imitations until the pattern had become so commonplace its authenticity was simply taken for granted. For that matter, no one even seems to really know just why the “real bond” pattern appeared in the actual movies in the first place. There has been a whole lot of discussion about the watch itself, and considerable speculation about the strap. One common version of the legend holds that during filming, director Terence Young simply slipped the Rolex Submariner off his own wrist when the props department didn’t have one ready. 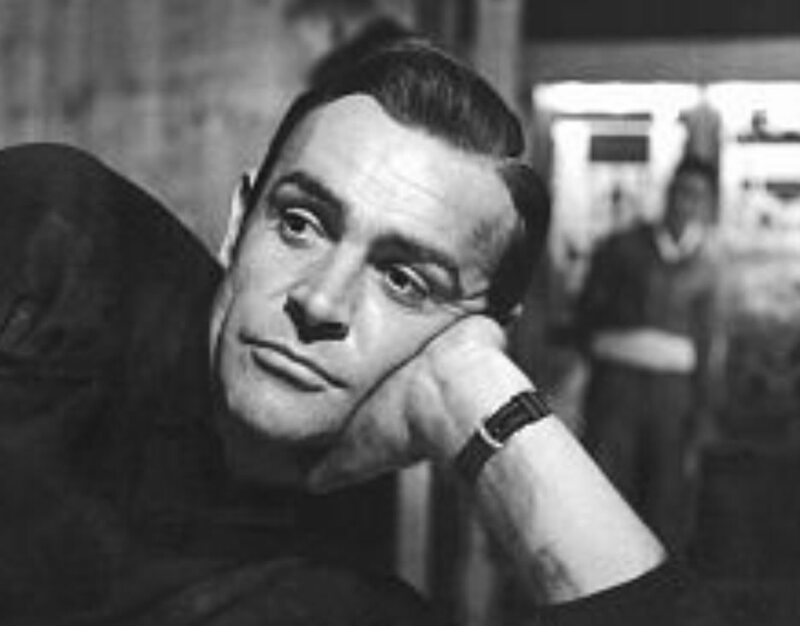 The bracelet couldn’t be quickly resized to fit Sean Connery’s larger wrist so a ubiquitous dime store nylon strap was substituted for simple expediency. 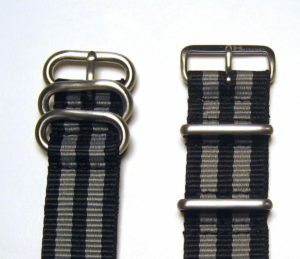 Vintage simple nylon strap in what appears to be matching color scheme, but with black color instead. To confuse things still more, the colors by all rights seem to be those of the Royal Artillery Golfing Society, an oddity which no one seems to be able to explain either as it wouldn’t fit in with Bond’s supposed naval background. It would seem to lend credit to the idea though that the strap and its colors were simply chosen arbitrarily during filming, and collectors have been expending unwarranted energy debating the supposed associations of a fictional character. 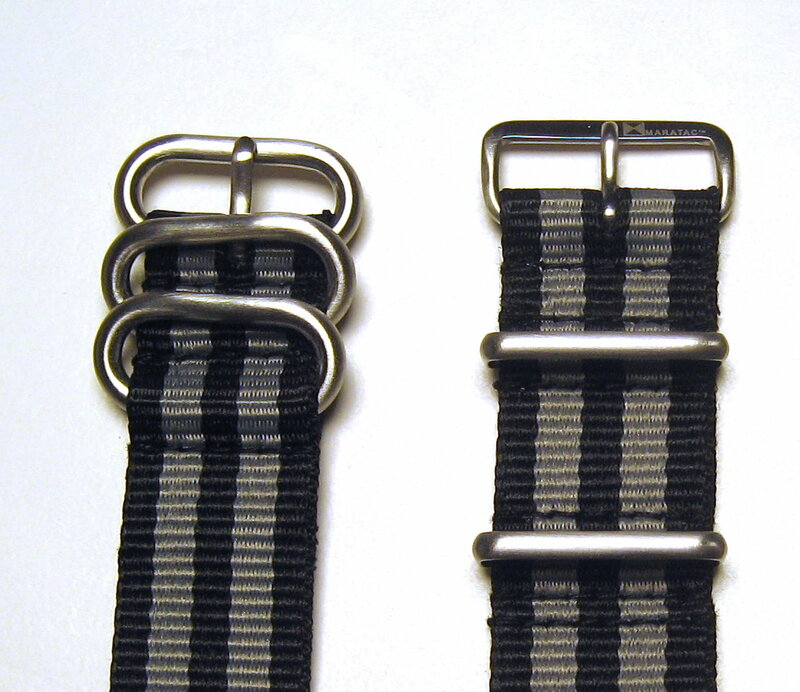 In recent months several vendors have emerged, selling their version of what they believe to be the “Real” James Bond straps in various sizes, constructions and patterns. One of the best and most faithful reconstructions of the pattern are the Real Goldfinger James Bond straps sold by Aliasmarlow on eBay. 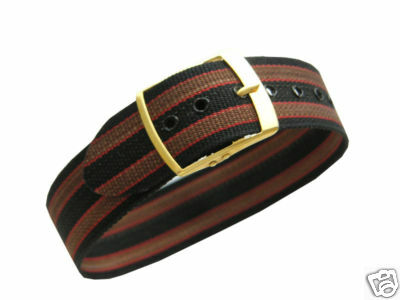 Alias' "Goldfinger" Real Bond Straps. They seem to be the perhaps the best best mix between faithful authenticity and upgraded (if incorrect stricly speaking) features like a quality stainless steel buckle. The coloring of the nylon fabric seems to be among the most faithful to the “original,” pattern, and the one-piece design uses a self fabric keeper as pictured in the Bond movies. And at $25 in a variety of widths with free shipping, they’re also considerably cheaper than some of the other, less “correct” reproductions offered by other sellers.